I wasn't interested in hand-held computers, or PDAs (Personal Digital Assistants) as they're now known, before I went to work for GO Corporation. There I saw and worked with a wide variety of Intel-based tablet computers. (I spent almost four years writing C programs for PenPoint, GO's home-grown operating system for pen-based computers.) The problem with PenPoint was that it didn't interoperate with anything at all; the big lie was that a business executives would emerge as a new class of computing purchasers. (That the most vociferous purchasers of new technologies has always been the geekly classes didn't dissuade the writers of (or investors in) GO's business plan.) GO died an ignoble death, pecked to demise by short-term interests. Thankfully, the PDA didn't die with GO. 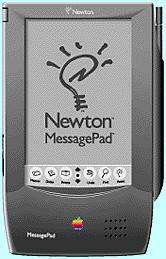 Apple had developed the Newton MessagePad during the latter years of GO. The original model was woefully underpowered, but it was small and only slightly overpriced. (For all the talk about consumer-level electronics, new toys always seem to debut at over US$500.) The photo at right shows the 100 model, known to cognesceti as the OMP, Original Message Pad. I'm a great believer that technology should be eye-catching. Let 'em stare - if they're captivated they'll be open to the idea off using a PDA in their own lives. Shortly after the introduction of the OMP it's larger, faster sibling appeared: the MP 110. I was lucky enough to get a transparent model, a few of which were made as promotional items for Apple and Claris employees. (Normal Newtons are a rubberized black - the 100 and 110 - or a hard very dark green - the 120/130/2x00.) Transparent computing equipment sells itself; I never understand why I can't get see-thru PowerBooks. Ahhhhhh. My Newton. An amazing piece of electronics. Ne'r did I realize how much use a personal digital assistant (PDA) could be. Even though I worked for the ill-fated GO Corporation for almost four years, and worked on many of the early pen-based tablet computers, the Newton took me by surprize. Newton works as an adjunct to my PowerBook, allowing me to synchronize data on both platforms. (There's a Newton Connection Kit for Windows as well as MacOS.) For some reason, upper management at GO never understood that pioneers of new technology are people already invested in cool, nifty, technology. A travelling executive who has a secretary fax documents isn't going to be ready for the cutting edge of miniturization. It is a very cool toy - and that should be taken as a compliment. A long time ago, Jean-Louis Gasse said that Apple products "smell like tomorrow" - he was speaking about the original PowerBooks, but the idea carries on. Using Newton makes me feel like I'm tapping into the optimism of the future; I may not be able to travel the galaxy in the USS Enterprise , but I can still use a hand-held, tricorder-like, device to manage the data I encounter in my life. 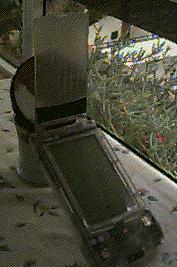 The photo at right shows my transparent Newton 110 sitting on a table in the tropics. During my trip to Eivissa and Gran Canaria my Newton became a life-saver. 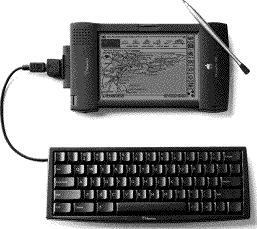 When my PowerBook died from poor electricity I continued to write my CU-SeeMe book - Internet TV with CU-SeeMe - on my Newton. I had to deal with poor handwriting recognition (which I overcome with Grafitti), but all in all things went pretty well. The Apple heavy-duty NiCad battery back more than allowed me to work all day and it recharges very quickly. If it wasn't for the 110 I'd have been completely blocked. Nobody on the island has anything close to this level of technology. Everybody else is at an Intel 386 level, although there's the most rudimentary Internet connectivity just coming to the island. Apple - with ex-GO employee Sandy Bennett at the helm of the Newton division - gives the platform a boost into the real world with the introduction of the MessagePad 2000 (or MP2K as it's known on the 'net). This was the machine for which I was waiting. I jumped at the chance to buy one, and a few months later I wrote an article about my impressions of the new palmtop computer for my ISP's monthly newsletter. The "two thousand" has a bigger screen capable of displaying 16 shades of grey, but best of all it has two PCMCIA slots, so I can have a modem and a storage card inserted simultaneously. This makes it a machine capable of connecting to the Internet, although the limited amount of RAM dedicated to the heap limits its ability as a web-surfing tool. Apple has been very unhelpful in this regard, but a veritable flood of user complaints will undoubtedly force them to somehow increase the heap. All of a sudden my MP2K is giving my PowerBook a run for its money. (You can see me using the Newton in a very dusty hardware-hostile community while at Burning Man in 1998; mention and photos are here and here.) When I'm on a business trip I can survive for a week with only my handheld. The problem is one of what I'll call "digital community", the digital environment caused by using one platform for a period of time. All your email and documents are on your desktop or laptop; switching to another piece of hardware means that you leave all that context behind. That alone is a stumbling block. And because Eudora for Newton (seemingly abandoned by Qualcomm) doesn't have the ability to synchronize filters and address books (and the whole email digital community) I'm left with a forced email-checking environment. It's not yet a complete solution. The user community is excellent, and the freeware and shareware are excellent, but somehow it's not yet a complete replacement for a laptop. It's close, though. But I'm doing more with this Newton than with previous models. I fashion a cable that'll connect my MP2K to my tiny GPS (Global Positioning System) reciever. I should be able to display my movements in real-time on a map of the region. And I've recently read that someone is using their Newton in conjunction with a digital camera during a trip to Mt Everest, but it seems to be a custom hack and not a general-purpose solution. Autumn 1997. Apple announces the MessagePad 2100, which fixes the heap problem. There's an upgrade program for owners of the MP2K, and I jump at the chance to remedy the one fly in the ointment. After a three-day turnaround my "twenty-one hundred" is flying on the net. Yes! Finally! And the handwriting recognition is good enough that I'm rarely using Grafitti. News reports say that a lot of the MP2x00s are selling, so it seems that Apple has a hit on their hands. This should ensure a comfortable place for Newton within Apple. In fact, for the fourth quarter of 1997 (if memory serves) the profit reported by the Newton Systems Group is the lion's share of Apple's entire profit, what with various bad decisions and write-offs. February 27 1998. The MP2x00s are still selling like hotcakes, and the completely Japanese versions are being rolled out by a third party, but Steve Jobs announces Apple will cease development on the Newton line. The few machines left in the retail channels and Apple inventory are quickly snapped up. Users and developers are in a sort of shock. Webmasters begin to fly one of several Newton Jolly Roger flags or logos. Apple yet again burns bridges it scarcely seems to have to burn. What a luxury. I don't get it. This page is part of the Apple Newton Web Ring. Visit another site on this ring. Add your Newton page to this web ring.